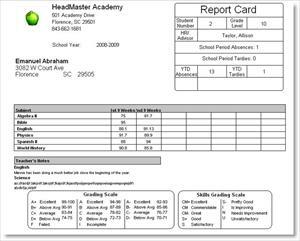 Please take a look at the sample reports below. If you see a report you like, please click this link. To access the full image, click the sample. 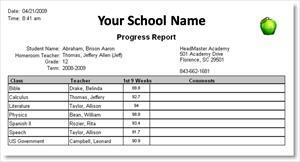 1A This progress report displays the grades for a single grading period along with teacher comments. 1B This report card displays each quarter grade along with a quarter exam and a final grade for the year. 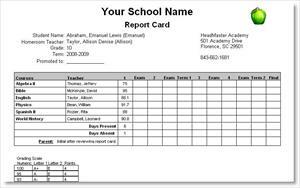 1C This report card can display quarter, midterm exam and semester grades along with school attendance totals and a custom grading scale. Teacher comments are also available for display. 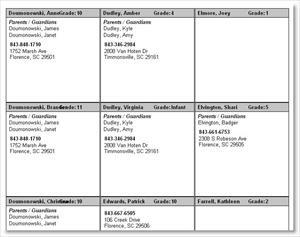 1D The student directory is listed by student and displays all pertinent student demographic data.